Each and every week when we teach, our priority is to point our kids to Jesus. Our goal in teaching is to teach every story and passage faithfully, and in doing so to show our kids how each one connects to the greater gospel story that arcs through Scripture. That is why The Gospel Project exists: to help prevent us from missing the forest for the trees. But we have to be just as careful not to make the opposite mistake and miss the trees for the forest. The details of the stories we teach matter, and often God gives us great points of application in those details, subordinate to the greater application of responding to, and living through, the gospel. This week’s session provides us with one such application that we don’t want to miss: how do we treat people who have hurt and wronged us? It didn’t take long for word of the Israelite victories over Jericho and Ai to spread through the Promised Land. The remaining city-states realized they were in trouble, so they came up with a plan: they would form an alliance against the invaders. Everyone that was, except for the Gibeonites. They had a different solution. Pretending to be nomads, the Gibeonites made a treaty with Israel instead (see Josh 9). By the time Joshua and the Israelites learned the truth, it was too late. The treaty could not be broken, so the Israelites made the Gibeonites their servants instead. But while the Gibeonites were protected from the Israelites, their craftiness left them exposed to the wrath of the other city-states, which chose to attack them out of retribution. When the Gibeonites sent word to the Israelites that they were under attack, Joshua and his people had a decision to make: would they honor the treaty or not? We can imagine the thoughts that likely went through the minds of God’s people. The treaty was unjust, should they have been expected to honor it? Why should the Israelites demonstrate integrity to a people who had deceived them? 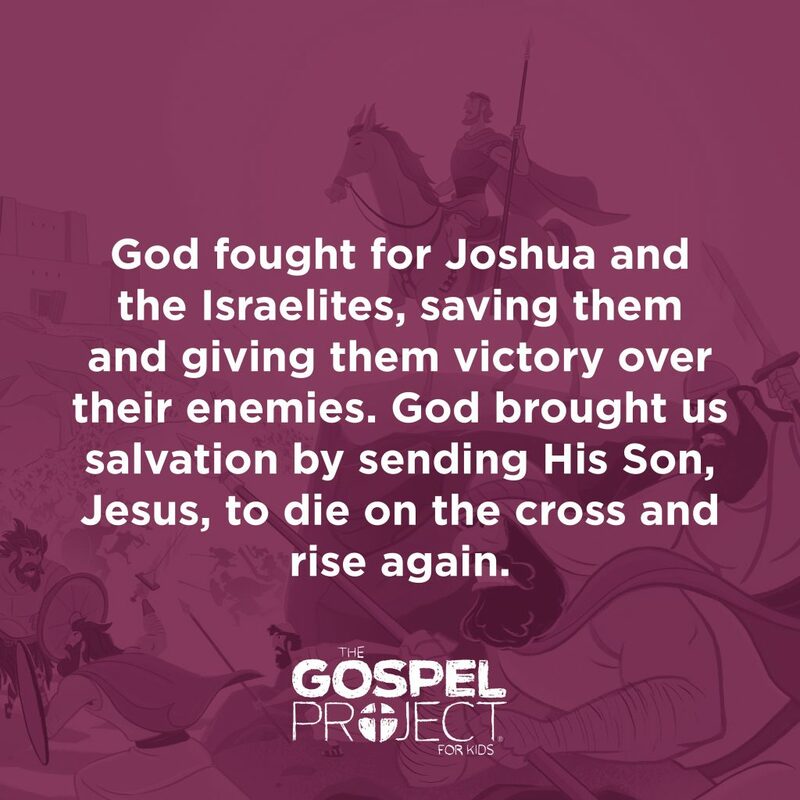 But God encouraged Joshua not to fear; He had given the Israelites all of their enemies. So Joshua and the Israelites headed into battle in honor of their treaty. The rest of the account is the focus of our session; it is what leads us to the Christ Connection and the main take-away. But I want to pause here so we can be sure to see an important tree or two that make up this forest. Each of the kids we lead has a Gibeonite or two in his or her life. And we do too. We have all been wronged by others. We have all been hurt by others. And just like Joshua and the Israelites, we have to answer the critical question: How will we respond? Our culture tells us how to respond: Get even. Our hearts tell us how to respond: Get vengeance. But the gospel tells us another way to respond, a better way: Give forgiveness. This was the point of the parable of the unforgiving servant in Mt 18:21-35. We are a people who have been forgiven of a priceless debt—our sins against holy God. In light of the lavish forgiveness we have received, how can we fathom withholding forgiveness from others? Yes, the wounds others have inflicted on us hurt. But they do not compare to how we have wronged God. And because of this, we should seek to forgive others of whatever they have done. The gospel compels us to forgive without limit. Is that hard? You bet! But that is what the gospel is all about. And the beauty of the gospel is that we are not left to our own devices to muster such forgiveness; it is born by the power of God at work in us and through us. The reality is that when we hold on to bitterness and anger, not only do we fail to express the gospel, we hurt ourselves further. The peace we long for is found in forgiveness—remembering the forgiveness we did not deserve but received from God and extending likewise forgiveness to others. Preschool Tip: You may not have the time and opportunity to explore this theme of forgiveness with your preschoolers, but if you do, keep it broad: God forgives us of our sin, no matter what, in Christ and He empowers us to forgive others too. Kids Tip: We wish the kids we serve were protected from pain and heartache, but they are not. The reality is that some of our kids have already been deeply hurt by others. Prayerfully consider challenging and encouraging them to extend forgiveness. Also, if you do have a conversation about forgiving others, be sure to know your church’s policies and procedures for reporting what you might hear. It is good to know that in the first place, but conversations like this one make it vital. C. S. Lewis, Mere Christianity (New York, NY: HarperOne, 1980, reprint 2001), 50.